Whether you’re having a Kids Party, Corporate Event or Family Function. A skilled master of magic will always do the trick! Our Magicians will perform slight of hand close up work with cards and coins or full magic shows with props and interactivity with the guests. 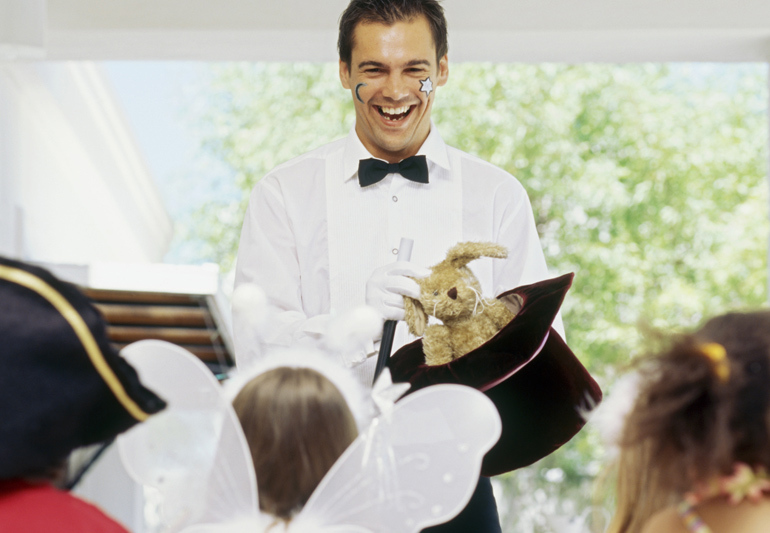 Our Magicians also can perform dazzling High-End Magic Shows with Props, Animals and Dancers ! What ages are Magicians good for? We have professional Magicians who specialize in all age groups. They can amaze guests during the cocktail hour of a corporate party or wedding or entertain kids at a birthday party. Let us know your goals and we’ll book the right Magician for you. Tell us your dress code, theme and age group and we’ll make sure our Magician arrives in the proper attire whether it’s a tuxedo, colorful outfit or other fun costume. We want a Magician who also can do Fire Eating and Juggling. Is that possible? Yes, you might want to ask us about our Multi-Talent Entertainers who besides being Master Magicians also can do many other forms of entertainment ranging from Stilt Walking to Juggling, Fire Eating and More. This is a great ice breaker at Cocktail Hours , Company Parties, Family and Promotional Events.